I’ve changed my mind about the structure of my blog… I had planned to “tell my story” chronologically. The first few posts would be historical until I caught up, and from then on I would post as I learned or discovered new things… but it’s been two months since my first (and only) post, so in the interests of actually getting my thoughts out I’ll just post them as they come! From now on the “journey” narrative will be mixed in with my current musings. 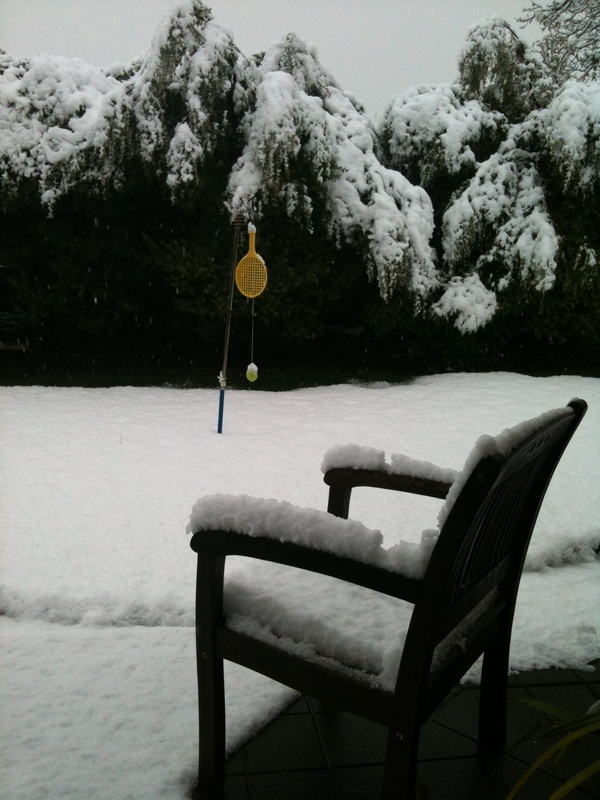 My back yard this afternoon… it rarely snows here! Today’s musings are on the topic of surviving… I am slightly drowning at the moment in assignments and reports, so my use of engaging and worthwhile ICT activities in my lessons has slowed to a trickle. For several weeks it stopped altogether, while I was in “survival mode”… until I remembered my own advice that I give when trying to help colleagues with ICT: Start small, but start somewhere (or “start simple, but start something” as I wrote in the last post). In the last week I have made an effort again to do little things (very little in some cases!) in each lesson with ICT. I was reminded again how worthwhile the time investment is when I saw the students’ engagement improve! Thankfully we have the day off school today due to a rare snowfall. It’s a welcome opportunity to get some reports and study done, as well as to reflect on the chaos of the last few weeks and the effect of that chaos on my teaching. Of course it’s also a great opportunity to finally add another post here! Start small, but start somewhere – what are some ideas for small things you could do with ICT in your lessons? For those of you who are just beginning your ICT journey, this could be a starting point; for others, this could be a baseline to fall back on when in “survival mode”, rather than letting your ICT use disappear altogether. A slightly bigger question, and one that definitely needs to be constantly kept in mind at all times: Where is the line between using ICT in lessons for the sake of using ICT, and using ICT in lessons to maintain a baseline on which we can build engaging and worthwhile activities as we feel able?